Sly joined our family in November 2007. He is the most beguiling of my "kids" with his cheeky and loveable nature, and most important of all, he has fitted in with my Jack Russell Terriers extremely well. 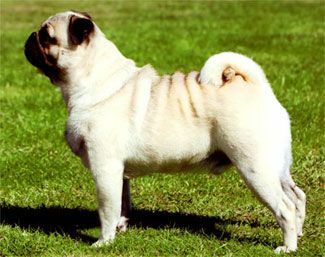 I have long waited for a pug to call my own and thanks to Trevor and Elaine Powell of Everlaine Kennels, I have my wish. I fell in love with him when Elaine kindly offered to let me show him so that I could learn about pugs while waiting for a puppy of my own. But, we bonded so well that he refused to show for Elaine and I asked for him instead of a puppy. I started showing him as a little baby and he has a Baby In Group and a Minor Puppy In Show (Pug Club Of Vict) Open Show to his credit. He is living up to all of my expectations. Sly & I have hit the show ring together and on his first time out with me as his new owner, he was awarded Reserve Challenge at the Kilmore Kennel Club Show in December 2007. With his "look at me attitude" in the ring you can't help but notice him!! He is also a Multi In Group & Runner Up In Group winner and a Multi Class In Group winner at all breed and speciality breed shows. More exciting news - at the Yarra Ranges Kennel Club, 13.1.08, Sly was awarded his first Challenge points and Best Of Breed, he then went on to win Puppy In Group and was run for Puppy In Show. What a fantastic way to start off the new year!! Sly has continued his winning ways with a Best Of Breed/Junior In Group and Junior In Show at Camperdown & District K.C. the day after he turned 1 year old. He finished this year (2008) by winning a 19 point Best Of Breed at the Inaugural New Year's Eve Show held at KCC Park, leaving him with only 6 points to go to finish off his Championship. This boy continues to amaze me with his cocky and never say die attitude in the ring. Sly has retired from the show ring and enjoys hiimself sitting in the sun with his daughter Cobi. NEWS FLASH!!!!!! AT CRANBOURNE DOG CLUB UNDER INTERNATIONAL JUDGE - Mr. P. MUZA (ARGENTINA), HE WAS AWARDED A 25 POINT BEST OF BREED & THEN FINISHED OFF THE DAY WITH RUNNER UP IN GROUP & AUST. BRED IN GROUP. AT NOORAT & DISTRICT KENNEL CLUB UNDER JUDGE - Mr. R. BRIDGFORD, HE WAS AWARDED A 20 POINT BEST OF BREED, THEN WENT ON TO BEST IN GROUP & AUST. BRED IN GROUP.